Clinical research has shown that an early secure fixation of a prosthesis is prognostic for the life span of the prosthesis. One of the purposes of experimental implant research is to examine the effect of different treatments on the fixation of implants. By finding an optimal fixation of a prosthesis the life span can be prolonged. The result of this may be that the patient does not need a replacement of his prosthesis and with this avoid surgery. The fixation of an implant can, among others, be evaluated by the use of a biomechanical push-out test. In order to execute a biomechanical push-out test you need to make a bone block containing an implant (See ”Hard tissue preparation”). The push-out test is made by pushing the implant out of the bone block with a constant velocity while the power with which the implant is pushed out of the bone block, is registered. 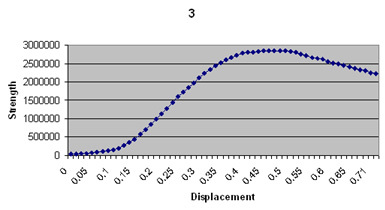 From the registered values it is possible to draw a force displacement curve. This curve makes it possible to calculate parameters that give us information about the biomechanical fixation of the implant. 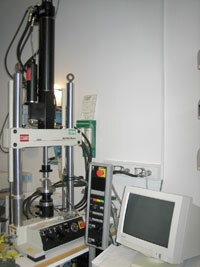 At the Orthopaedic Research Lab, biomechanical push-out tests are performed by a MTS Bionics Test Machine.